Note: What's considered basic and foundation for Evangeline is technically a 'spoiler' from the anime's viewpoint. Prepare to be very unsatisfied as you read this if you know anything about her. 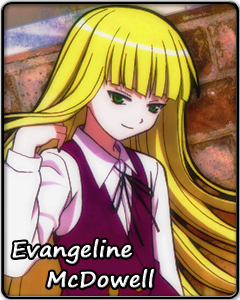 Evangeline is an 800-year old (daylight walking) vampire and eternal loli. (Although she can enchant her body to be an adult, it's an illusion.) Until 15 years ago, she was a very dangerous dark mage who still is feared to this day. However, 15 years ago, she met Nagi (Negi's father, current whereabouts unknown) and after being saved by him, she travelled with him for about a month. She fell in love with him but was rejected. A failed angry attack later, Eva was cursed and sealed by Nagi then put in Mahora Academy under the care of the Principal (an old friend). Nagi did this to let her 'live in the light' for a while, but she has been having a long love/hate grudge on him over these 15 years of repetitive lessons and idiot youngsters. When Negi came to the Academy and ended up as her homeroom teacher, she started planning on breaking free of the imprisoning curse and her power suppression (she can't go outside the Academy's town-sized campus). To get full freedom, she needs to drink blood from Nagi's family line - a fatal quantity of Negi's blood. The plan failed: Eva felt like toying around with Negi and the time limit to her plan ran out faster than expected. She and Negi reached a form of ceasefire and compromise. The 15 years of being around humans did help anneal the dark pride and bitterness she had when she was younger. It is still there - 800 years give a healthy dosage of cynism and cold-bloodedness, but she does grow to care for Negi in her own way. She no longer tries to kill him to free herself. Generally, she'll have a bored and aloof demeanour in ordinary situations. This is as far as this biography is allowed to write of Eva; it is not the Eva that Negima fans will be voting for. To see the full, long history of Eva's character development, you will have to seek out the manga yourself.